I have been set a little challenge by Princes to turn that retro classic corned beef into a speedy family supper for under £5! Corned beef for me brings back memories of my Grandad enjoying it in sandwiches. It most definitely is an acquired taste with many people turning their nose up at it but it got our ancestors through world wars and I think more families should give it a go. Princes have improved their recipe over the years bringing out a reduced salt version and a lean corned beef so it really isn't as fattening now as most people remember. It contains 100% Beef and is high in protein. Tinned foods are fantastic for storing in the cupboard for when you are short of time. 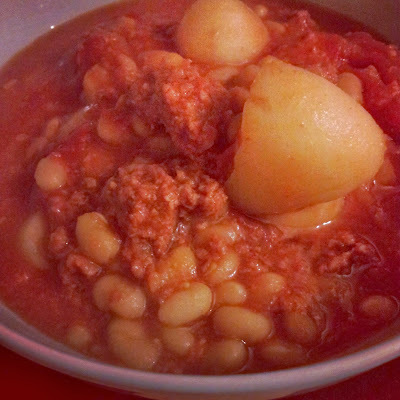 The first recipe people think of when this store cupboard must have is mentioned is Corned Beef Hash so although it isn't adventurous I have decided to share with you my version of this recipe! Here is the recipe for my Camping Corned Beef Hash! This recipe is perfect for camping because all the ingredients come from tins but I make it at home quite often for a quick filling dinner when all I want to do is snuggle on the sofa with a huge steaming bowl of comfort food! Pour the tomatoes, potatoes and beans into a large saucepan and simmer. Take your tin of Corned Beef and use the little key to open it...this may need to be done by someone who has used one before, ideally someone who was born before 1980! I must admit although I knew how to use it I did use the key upside down and made a pigs ear of it! Chop your corned beef into bite sized cubes and add to the pan. Simmer until everything is warmed through and just bubbling. Serve in a bowl...with a spoon and a chunk of crusty bread! *We were sent a couple of tins of Corned beef for review purposes but rrp is £1.99 and can be found in most supermarkets. The total I spent without the Corned Beef...just 69p!!! I don't see the difference in this recipe using supermarket own brand ingredients or expensive brand names so went for Asda Smart Price!